If you are a permanent resident, you can take steps to become a U.S. citizen. The process of applying to become a citizen is called Naturalization. Naturalizing has benefits: U.S. Citizenship never expires, and citizens are allowed to vote, run for most public offices, and are not subject to deportation from the country. At Karam Immigration Law, our team provides personalized service in our clients’ cases. We take on complex cases and difficult immigration matters. We help find creative solutions to help people become U.S. citizens. Call Karam Immigration Law today at (832) 582-0620 to set up a consultation. The process by which a person becomes a citizen is called naturalization. Once a person becomes a citizen, he or she can participate in our democracy through voting. His or her citizenship does not expire, and he or she will never have to worry about losing his or her legal status and being forced to return to his or her country of origin. There is no waiting period to become naturalized, but it is critical that careful attention be applied to the process. See below for detailed description of each of these Naturalization law topics. After a certain amount of time as a permanent resident (five years for most people, and three years for people who are married to and residing with their U.S. citizen spouses), you may apply to naturalize - the process you undergo to become a citizen. You must also attend an interview at your local USCIS office, where you will take a civics test and an English test. The English test can be waived under certain circumstances. During your interview, you will answer questions about your immigration history, any criminal history you have, and provide documents for a USCIS officer to review. In most circumstances, a person must be a lawful permanent resident (possess an immigrant visa or "green card") before taking the next step to become a citizen. A lawful permanent resident may seek naturalization after being a permanent resident for five years. During these five years, the permanent resident must meet certain physical presence requirements (in many cases, a person must have spent at least 30 months of the previous five years in the United States). In addition, an applicant for naturalization must have maintained continuous residence in the United States and resided at their current residence for at least three months. Even people who meet the physical presence requirements for naturalization may be denied citizenship if the Immigration Service is not satisfied that they maintained a residence here. A lawful permanent resident with a spouse who is a U.S. citizen may apply for naturalization after three years if their spouse was a U.S. citizen for the duration of the previous three years, and they were married and living together during that time. You do not have to have a completely clean criminal history to become a citizen. However, you must be a "person of good moral character." Any conviction can be considered as evidence of moral character in an application for naturalization, so it is important to see advice from a reputable immigration attorney when applying for naturalization if you have a prior criminal issue. During the naturalization process, you will be asked to disclose facts about your past. If you do not disclose them, your citizenship may be denied on those grounds alone, even if the facts not disclosed would not be grounds for denial. If it is discovered that a disclosure was not made after naturalization is complete, your citizenship can be revoked. If there are details about your past that concern you, consult with an attorney. You must also be at least 18 years old to be naturalized. To become a citizen, you must pass two tests, a civics test and an English test. The civics test covers aspects of U.S. government and history. It is just 10 questions, six of which must be answered correctly to pass. The test is only offered in English. The English portion consists of writing, reading and speaking components. If you are older than 50 and have been a lawful permanent resident for at least 20 years, you may be exempt from the English test. The law provides for expedited processing of applications for spouses of U.S. citizens employed by U.S. companies who are being transferred overseas for work assignments. In these expedited naturalizations, the permanent resident spouse seeking to naturalize must be planning to depart the United States after naturalizing in order to join the U.S. citizen spouse. These applications involve coordination with the Immigration Service and preparing documentation to prove that the applicant satisfies all of the requirements for this special category. The law makes a special accommodation to fast track those seeking to become naturalized who have served in the Armed Forces, including the Army, Navy, Air Force, Marines or Coast Guard. If you are currently serving or are within six months of an honorable discharge, you do not have to meet residency requirements to become a citizen. If you served during a conflict, including any time after September 11, 2001, the six month requirement is waived. Additionally, the spouses and children of members of the U.S. military may seek naturalization without meeting residency requirements. For instance, if you met your spouse while he or she was serving overseas and became married, you do not have to wait until you have been a permanent resident for five years to naturalize. If you experience issues with your N-400 application for naturalization, an experienced immigration attorney can help you through the process. Helping our clients prepare for interview and attending interviews with our clients. If you’ve had your N-400 interview but no decision has been made on your case, there are additional steps you can take to try to resolve your case. An experienced immigration attorney can help you determine if there are issues with your N-400 application and can assist with contacting USCIS to determine if a decision can be made in your case. In some situations, a delay after interview may mean difficulty or delay in completing background checks, which an attorney may be able to help press USCIS to complete. In other cases, a delay in issuing a decision in your case after interview may mean that an issue was identified in your case after your interview was completed. By law, USCIS should make a decision on your case no more than 120 days after your interview. Once this time has passed, you may consider filing a federal lawsuit to request that USCIS take action. However, you may also choose to continue to work through USCIS’s channels to try to resolve the issue first. At Karam Immigration Law, our team includes Houston naturalization lawyers who help people attain citizenship. We can advise you on any potential issues that may come up during the naturalization process and help determine the best way to address those issues. Kathryn Karam, founder and President of Karam Immigration Law, is experienced in tough, complicated immigration matters. Kathryn and her team of attorneys help permanent residents become U.S. citizens in the Houston area. Attorney Karam specializes in unusual, complex and unique citizenship and naturalization cases. Call Karam Immigration Law today at (832) 582-0620 to set up a consultation. Karam Immigration Law represents people seeking to become citizens throughout the Greater Houston region, including Alief, Sugar Land, League City, Clear Lake, Kingwood, The Woodlands and Cypress. In some situations, a person does not have to apply to naturalize by taking a test and meeting the legal requirements for the naturalization process. This sometimes happens when a parent of a child under age 18 naturalizes or a child is born overseas to a parent who is a United States citizen. In these situations, a person may apply for proof of citizenship at the time that the person acquired or derived citizenship from their parent. In some cases, an individual born outside the United States may acquire U.S. citizenship at birth if one or both parents are U.S. citizens and they can show that they meet certain physical presence requirements. This process differs from naturalization as it does not require any testing for English ability and knowledge of U.S. history and government. An applicant for a certificate of citizenship is not required to show good moral character and does not have to maintain a continuous residence in the United States or be physically present in the United States for any particular period of time. If you believe you may have acquired citizenship from a parent, it is important to work with an experienced immigration attorney to prepare your application for a certificate of citizenship. Some individuals may derive citizenship from their parents if they are under 18 when one of their parents naturalize. Like acquiring citizenship, this process differs from naturalization as there is no testing required and no good moral character requirement. If you believe you may have derived citizenship from a parent, it is important to work with an experienced immigration attorney to prepare your application for a certificate of citizenship. For those applying for naturalization or getting proof of U.S. Citizenship, the process of working with U.S. Citizenship and Immigration Services or the Department of State can be complicated. 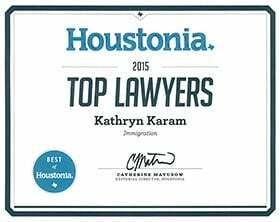 As a Board Certified Attorney in Immigration for Houston, TX, Kathryn Karam understands the system and can help guide you through. Kathryn and her team are ready to help with naturalization and citizenship issues. Call today at (832) 582-0620 to set up a consultation.